One of the biggest complaints I hear from people is that they don’t have an office or dedicated space to corral the endless stream of papers, mail and just stuff that seem to come into our homes. Even if you’ve managed to cut down on the amount of paper that enters your house, an official landing spot and workspace can do wonders for keeping an organized home. In this post, I’ve rounded up three fantastic ways to squeeze in an office when you don’t have a spare room. Even though I do think formal dining rooms are making a bit of a comeback, there’s no reason they can’t pull double duty. A room that’s only used a few times a year really isn’t the best use of space, so why not turn a formal dining room into a dining-office-library combo? I guess that would be a triple-duty space! The key to making this work, of course, is to incorporate stylish and unobtrusive storage. I lovvvve a library-dining room for the coziness and character. Here, Emily keeps office storage on the bottom shelves in neat baskets the same color as the shelving. Decorative touches (vases, prints, mirrors, bowls, photos) as well as a table centerpiece keep the room pretty and help retain a dining room “look.” If she needs the entire workspace, she can simply slide the centerpiece over. When it’s time to dine, she can squeeze in another chair or two. This room from House Beautiful is a good example of unobtrusive storage. Office supplies can easily be kept behind the doors of a china cabinet or bookcase. It’s always fun to use a piece of furniture in a new way. A traditional, antique china cabinet that holds books instead of china is a fabulous way to add character and interest in your home. When it’s time for a dinner party, clear the table and pull up some more chairs. This dining room from Real Simple uses a secretary as a desk instead of the dining table. If you have an antique dining set or a table with a delicate finish, you may not want to use it st a desk and risk damage. A secretary is a great alternative because you can simply raise and latch the desktop when you’re finished with work. Notice too that simple file boxes, again the same color as the shelving, are a low-profile way to contain paperwork. If you use Pinterest, you’ve probably see many closet offices. This one uses pegboard to make efficient use of wall space. If you want to carve out office or crafting space in a guest room, this is a great idea. The concealed area is perfect for a printer or less attractive storage boxes. This cloffice can be concealed by a sliding barn door! Just think, you can be as sloppy as you want and hide the evidence by slipping the door shut! A stool instead of a chair makes sliding the door easy, as the stool fits neatly under the desk top. Kati from Houseful of Handmade stenciled a wall in her “cloffice” but you could use a gorgeous wallpaper, too. And you wouldn’t need very much! Even if you conceal your office with doors or curtains, I firmly believe that an attractive space is more pleasant to work in. It’s all in the details, right…?! The key to having an office in your bedroom or living room is to keep it as attractive as possible and congruent with the rest of your decor. You want the entire space to flow together naturally. You don’t want a beautiful room with a clunky computer desk and black plastic roller chair at one end. I love how Kristine from The Painted Hive added the gallery wall and the plants which almost completely hides the fact that this area is actually a convenient workspace. The computer hardware and cords are tucked into a vented cabinet. And that gorgeous chippendale chair! Here’s a secretary again in an 1700’s farmhouse. A beautiful antique secretary, armoire, or desk can serve a practical purpose as well as add to the overall style and character of the home. 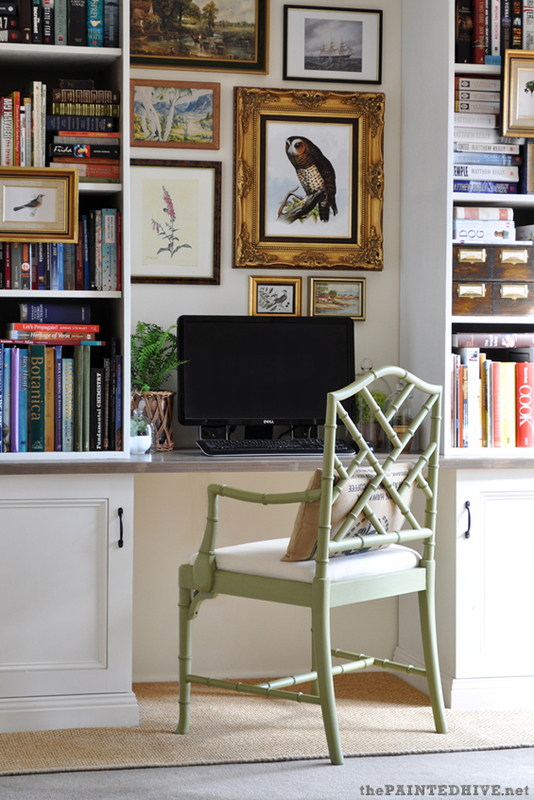 Add a vintage chair and you have the perfect work area that feels at home in any area of your house. So now you know! Anyone in any sized home can manage to squeeze in some sort of workspace and storage even if space is at a premium. All this inspiration makes me want to tackle my husband’s hideous $25 Ikea desk in our guest room. Next project!